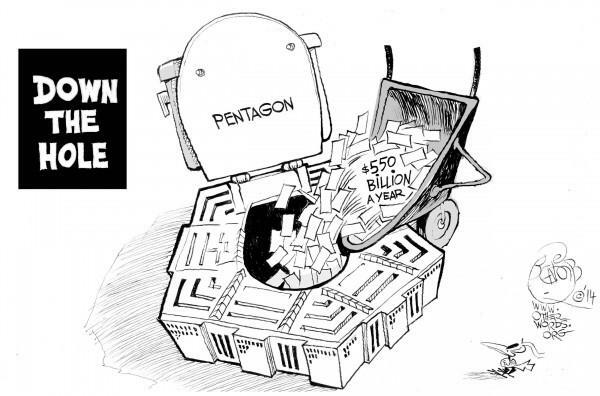 The Pentagon’s Defense Logistics Agency (DLA) has reportedly "lost track" of hundreds of millions of dollars it spent, said Ernst & Young, the accounting firm conducting the first-ever Pentagon audit, according to Politico. E&Y discovered that DLA "failed to properly document more than $800 million in construction projects," said Politico, which also reported this is just one of the many instances where millions of dollars went missing as the accountability system inside the Pentagon is broken. Worse, according to Politico, the first-ever audit, covering the fiscal year that ended Sept. 30, 2016, signals complete incompetence about how the Pentagon handles its $700 billion annual budget. Ernst & Young’s auditors found significant accounting errors in DLA’s process of tracking expenditures. There are minimal accounting records of where the money is going said the report. This does not bode well for accountability at the Pentagon, which has combined assets of $2.2 trillion.The Politico describes one section of the audit where Ernst & Young’s auditors found misstatements for some $465 million in construction projects. Another section described that there was very little documentation for another $384 million worth of spending. In one part of the audit, completed in mid-December, Ernst & Young found that misstatements in the agency’s books totaled at least $465 million for construction projects it financed for the Army Corps of Engineers and other agencies. For construction projects designated as still “in progress,” meanwhile, it didn’t have sufficient documentation — or any documentation at all — for another $384 million worth of spending. The agency also couldn’t produce supporting evidence for many items that are documented in some form — including records for $100 million worth of assets in the computer systems that conduct the agency’s day-to-day business. “The documentation, such as the evidence demonstrating that the asset was tested and accepted, is not retained or available,” it said. The auditor also said that around $100 million worth of assets in computer systems had very little documentation. The report, which covers the fiscal year that ended Sept. 30, 2016, also found that $46 million in computer assets were “inappropriately recorded” as belonging to the Defense Logistics Agency. It also warned that the agency cannot reconcile balances from its general ledger with the Treasury Department. "The initial audit has provided us with a valuable independent view of our current financial operations," Army Lt. Gen. Darrell Williams, the agency’s director, wrote in response to Ernst & Young’s findings. "We are committed to resolving the material weaknesses and strengthening internal controls around DLA’s operations." “The key is to use auditor feedback to focus our remediation efforts and corrective action plans, and maximize the value from the audits. That’s what we’re doing now,” the statement said. Back in January, the team of 1,200 auditors found some $830 million in “missing” helicopters as the audit kicked off into 2018. As the army of auditors penetrates deep inside the Pentagon’s financial records, we wonder what the 1,200 will find next as they descend further down the rabbit hole of decades of failed proxy wars, regime changes and dictator slush funds?